CPB protects against inflammatory arthritis in mice. CAIA was generated by i.v. injection of a suboptimal dose (2 mg) of anti-collagen antibodies on day 0, followed by i.p. injection of LPS on day 3. (A) CAIA severity and paw thickness in Cpb2–/– and Cpb2+/+ mice. 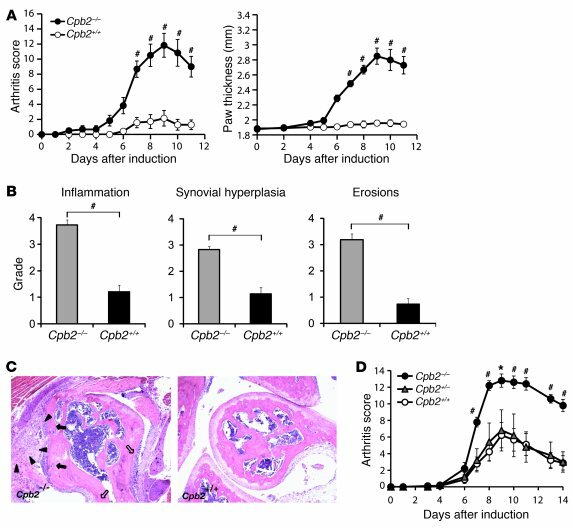 Compared with controls, Cpb2–/– mice exhibited significantly more severe arthritis from day 7 onward. (B) Histological scoring of arthritis severity based on degree of inflammation, synovial hyperplasia, and bone or cartilage erosions in the mice in A. (C) Representative H&E-stained sections of joint tissue from mice in A (original magnification, ×200). Arrowheads, inflammatory cell infiltrates; filled arrows, erosions of bone or cartilage; open arrows, synovial hyperplasia. (D) Gene-dose effect of Cpb2 on CAIA. CAIA severity was measured in Cpb2+/+, Cpb2+/–, and Cpb2–/– mice. 1 copy of Cpb2 provided the same level of protection against CAIA as did 2 copies. Results are representative of 2–3 independent experiments (n = 5 per group). #P <0.01, *P <0.05 vs. control at each time point, Mann-Whitney U test.